In June I took some work to a local gallery. I had been invited by the gallery owner to have my work for sale there. One of my pieces sold that first weekend. But then I heard nothing else, so I began to think that maybe it was a fluke and I wouldn’t be making regular sales, perhaps just a few a year. So I took some time to mess around with dyeing fabric and not worrying about creating any particular piece of art. But last week I got another phone call from the gallery owner. She had sold several more of my pieces just that day and now was very low on stock of my work…and oh, when can I come by with lots more wonderful work? Soon? Next week??? The first few days after the phone call I was frozen with self doubt. The same thought kept going through my mind, “what if I can’t do it again?”. I really wondered if I had it in me to make another piece that was good. 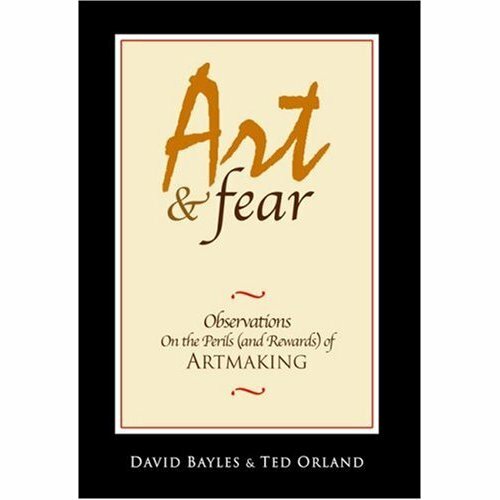 Then I remembered my trusty little book, “Art & Fear” by David Bayles and Ted Orland. I’m sure you all have a copy. I seem to be the last artist around to have found this little gem! And thank goodness I did. I bought it last year when I was struggling with just getting started, trying to push myself to go farther and outside of what was comfortable. So it was no surprise when I opened the book to find that a lot of things had been highlighted. I’ll share some of those things that struck me, just in case anyone out there is going through the same rough patch and can’t find their copy. “Making art is dangerous and revealing. Making art precipitates self-doubt, stirring deep waters that lay between what you know you should be, and what you fear you might be”. I struggle with this nearly every day. Each time someone asks what I do. I think it’s even harder as a textile artist because of the blank look you get from someone who expected you to say “acrylics” or “watercolors”. Wow. That’s right on for me. How about you? It’s that blank canvas. I wonder if there was something already special I’d know how to start or get it going. But then it turns out I just have to start and not worry (yeah, right) that it will stink. I’m still wishing for that magic ingredient, though. I’d keep it in a jar on my table. Sometimes I wonder if I’m the only one sinking in a sea of self doubt. Especially after I cruise some of the wonderful blogs of other artists (and you know who you are!) continually making and posting super fantastic fabulous work. I’ve actually stopped reading blogs and posting in my own for the time being, just to keep the fear and self-doubt monster at bay while I try to work. Thank goodness for this book. If you don’t have it, can’t find it, or know another struggling artist who could use a boost, “Art & Fear” is the best! I think the key to making it less stressful is to remind oneself constantly that the path leads somewhere. Every piece we make, successful or not, contributes something. So the goal is to learn from it and move forward. If it’s all a learning process, then it hardly matters if the piece itself is “successful.” Plus, we’ve all had the experience of showing a dud to someone and having them love it, right? Recently, I was showing a painted canvas that I plan to cut up and make into a series of small pieces, when the 2 people I was showing it to, said, “Stop, it’s great a it is.” Now I have to admit, I really can’t see it, and I plan to cut it up anyway — that’s what I’m doing now. But take the lesson — your dog may be someone’s treasure. And sometimes a really doggy dog (pace canines!) can be easily fixed by someone critiquing it. Recently on a blog I read a quote that basically said, all acts of creation are beneficial to the world. So let’s all work on erasing the self-doubts and enjoying the journey more. I’m looking forward to getting this book by the way — so Marni you must be the penultimate person to hear about it. Thanks. Thanks Kathy! I guess it wouldn’t be quite as much fun if we knew where it was going from the start, but it would be less stressful. I guess that’s where practice and confidence comes in…knowing that you can usually “perform” no matter what. I usually don’t feel like I’ve hit on any kind of zone until the very end of working on a piece, when suddenly everything seems to be coming together and I’m surprised that I’d made some serendipitous decisions earlier. Way to go, Mandi, on the sales. That is affirmation with a capital “A”! But I totally “get” the self doubt thing. So, would it be as much fun if we did “know” what we were doing? I am kind of intrigued by the adventure part of it, the “blank canvas”, as you put it. Starting somewhere and seeing where it leads. I don’t think I am able to plan it out entirely, kind of like life. But I do immensely enjoy the days where one gets “in the zone” as some like to call it. Perhaps that’s another term for “magic”.